Amorsolo worked until the last year of his life. Age was starting to catch up with him. He was afflicted with diabetes and arthritis in addition to his heart condition. His eyesight was also beginning to fail him and he had to undergo a cataract operation. In his later works, his compromised vision led to wayward brush strokes of red and blue lines where a mound of earth should be. Despite these challenges, the quality of his output remained at high levels and the popularity of his work never waned. What were probably the most painful tragedies struck him in his later years. In 1964, his eldest son Fernando, Jr. died from asthma and tuberculosis. The artist was so grief-stricken that he could not bear to attend his own son’s funeral. Seven years later in 1971, his youngest child Milo died in a car accident. The pain of having to bury two of his children was too much for Amorsolo to bear. 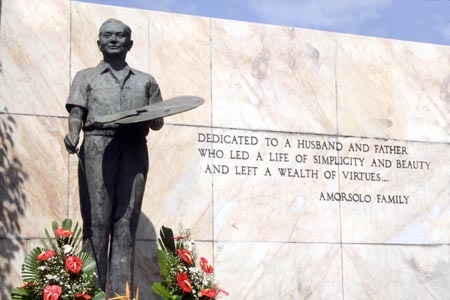 Five days short of a year after Milo died, Amorsolo died of heart failure on April 24, 1972. Amorsolo’s work continues to resonate among his countrymen decades after his death. His portrayals of an ideal and beautiful world drew the most ardent praises and the harshest criticisms. To understand the artist one has to appreciate the man behind Amorsolo. He was shy, innocent, and most importantly pure. These traits spilled over onto his canvas. It was not because Amorsolo was not capable of recognizing the dark side of society. He had his share of heartbreak and disappointment in his life but he deliberately isolated himself from these and chose to portray the bright side of the world. Not a shred of wickedness permeated his character and as a result his art is the purest manifestation of beauty. The basic desire to identify with what is good is what people inherently have in common with the artist. It is for this legacy that Amorsolo will be most fondly remembered.